This module allows to create and print labels in a easy and instant way. Through the template editor it is possible to create different label templates usable according to customer and article. Allows the insertion of the company logo and the bar code for the complete management of mark, U and dB parameters etc. Once saved, the templates are automatically selected and it’s possible to print all labels of Perfect Cut project in a few seconds. Manage more than a single label template (different by families/customers), with the possibility to modify the page, format and fonts. It use the same data of Perfect Cut. The fields are easily insertable on templates by drag-and-drop, than each field is changable by font and size. There’s the possibility to change sorting mode such as the one in compliance with assembly list. Allows also the insertion of the company logo, field print (even merged) using Bar Code characters and the definition of a possible space to visualize the shape. Note fields can contain up to 15 subfields, especcially by using management programs. With family field it’s possible to associate different informations: material or description code or even both or glass thickness or weight. It can have an univocal field with bar code which coincide with an information series (Material, Customer, Order, Yard, Sizes, Note1, Note2, etc.). When you print a label, the piece will be added into data base (SQL Server data base), allowing to assiociate the piece univocal code with all related informations. On production PC the application Perfect Code Client can read the department and/or the responsible (from keyboard or bar code) and the bar code of piece univocal code. The Client provides to save on data base these informations with date/time of when the reading is done. On piece level it can be defined print category (if it’s different from the standard one). It is possible to associate the printer and label template to a category. For example for tempering pieces it’s possible to define printer with red paper and for the other pieces with white normal paper, it’s possible to associate a template to laminated pieces, another to insulating glasses and another for single pieces. The possibilities are almost limitless. It is possible to handle not only a standard bitmap for all the labels (e.g. the company logo), but also a bitmap that can be associated to each piece: for example, a colored bitmap to identify the processing to be done after the cutting of the piece. It is possible to synchronize it to labels print with cutting pieces or display progress on cutting monitor controlled from an operator with a pedal. If numerical control allows it, there’s the possibility to associate cutting head path to labels print step from a little printer collocated on the arm of the cutting head. The synchronism can be done with different applications (for example Perfect Cut, Perfect TV, Perfect NC) or with some NC (for example Intermac e Macotec). With comunication through file it is possible to synchronize itself on a specific project, family, layout, and print all labels of that layout or a specific label to a related position. 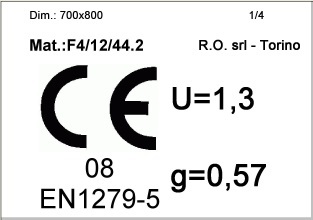 The Mark module allows on labels print to indicate a determinated composition, the trasmittance coefficent (U parameter) and other values typical of glass that you need to see on label with the mark. Perfect Cut saves the combinations of insulating glasses and the characteristic values (u, dB, g…) in order to propose it again in the future loadings.